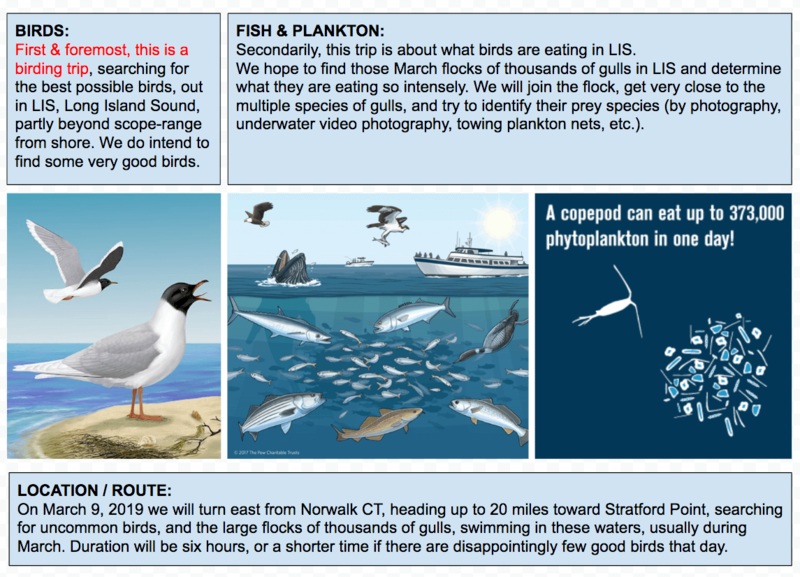 We have arranged a very unique one-time 40-mile “mini-pelagic” trip in LIS Long Island Sound on Saturday, March 9th. This is a trip for you, IF you like going into LIS waters which are usually not accessed by birders, with 35 other expert birders and top marine scientists, on a new $2.7million 63-foot QUIET hybrid-electric catamaran research vessel from the Maritime Aquarium at Norwalk. We are aiming for this trip to get lots of great birds and to determine what those thousands of gulls are feeding on offshore. We intend to find these large flocks, cruise into these flocks slowly, get very close to these birds, and learn more about what they are feasting on, using binoculars, cameras, plankton nets, underwater video, etc. One way or another, this will be a memorable one-of-a-kind cruise in LIS, not planned to be run again. Since the ship departs the dock promptly at 10:00am, please plan to arrive at the dock between 9-9:30 in order to not miss your chance to board safely. 1) immediately email to robben99@gmail.com . 2) Please pay $80 by check by February 9th. LIS Gulls and Plankton Trip <<click to view. Please contact me SOON, since we believe this ship will fill up its quota of 35 very rapidly.